Our membrane systems and waterproofing methods are guaranteed! We are committed to being the best waterproofing company in the industry, and we have the knowledge and experience to prove it. Blue Maxx has been Manitoba’s only certified Delta-MS installer for over 20 years. We are trusted to provide top-quality waterproofing services by builders and homeowners alike. 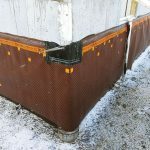 All of our exterior waterproofing services include a 20 year transferrable warranty that is backed not only by us, but also by Cosella-Dörken – the manufacturer of Delta-MS.
One of the most effective ways to keep your basement permanently dry is by waterproofing the foundation from the outside. 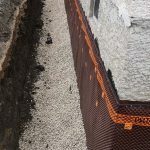 At Blue Maxx, we believe in using the highest standard of products to protect your basement from water intrusion – That’s why we use Delta-MS dimpled waterproof membrane. 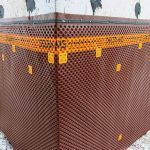 Delta-MS is a durable dimpled membrane that can be applied to EVERY type of foundation – concrete, cinderblock, stone, and pressure treated wood (PWF). Unlike traditional methods such as tar coatings and spray on sealants, Delta-MS is designed to bridge any gap, void, or defect in the foundation wall, creating a seamless protective barrier from water and moisture.